DreamSpa is a brand that is known for providing luxury bath and shower equipment. The Interlink Company is a top name manufacturer that offers great warranty programs with the sale of each Dreamspa shower head so long as they are purchased from an authorized dealer. This review of the top five DreamSpa shower heads is intended to introduce you to the amazing versatility of these products and provide you with full product descriptions, special features and an insight into the opinions of others who have purchased and used these items. The DreamSpa 3 way Rainfall shower head offers the dual function of a fixed head with the option for handheld showering action. The manufacturers recommend this head for holiday gift giving or as a housewarming present. 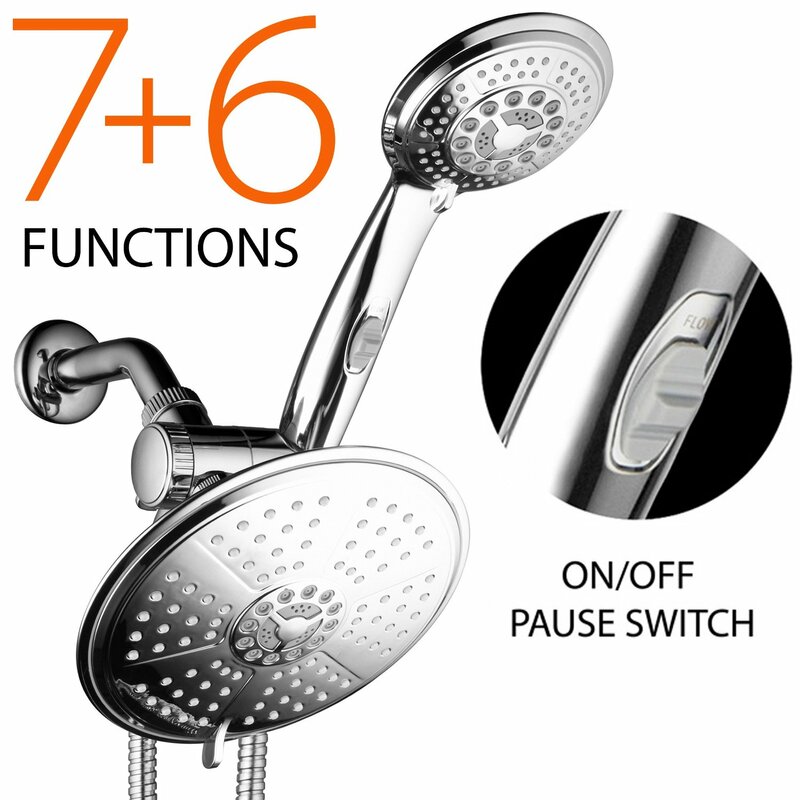 Two luxury shower heads may be used separately or together for double the showering options. You get one seven inch chrome face shower head and one 4 inch chrome face high power hand held shower head with seven separate settings. You can adjust this head for power rain, pulsating massage, hydro mist, eco rain, rain/mist, rain/massage or you can use the water saving pause feature for achieving the perfect shower setting. 3 zone click level dial features easy to rub clean jets. The 3 way water diverter is patented and features an anti swivel lock nut for securing the head into position. The overhead bracket allows for angle adjustment. The super flexible stainless steel hose is durable for long life and versatile for reaching any position needed. This head installs easily without the need for tools or a plumber and can be connected to a standard overhead shower arm in minutes. Customers gave this shower head an overall raing of 4.4 out of a possible 5 stars. Some felt that the hose could be a little longer, but most were pleased with the lightweight ease of installation with the limitless possibilities that the spray features offer including scalp massage, back massage and other settings. Maximize your shower pleasure with this luxury 3 way multi shower that offers a broad range of water spray and flow patterns. Easily find the perfect water setting every time whether you want a slow gentle massage, or a more invigorating high powered massage. This shower head combo features two separate shower heads that can be used singly or together and enjoy a fixed head shower or hand held. 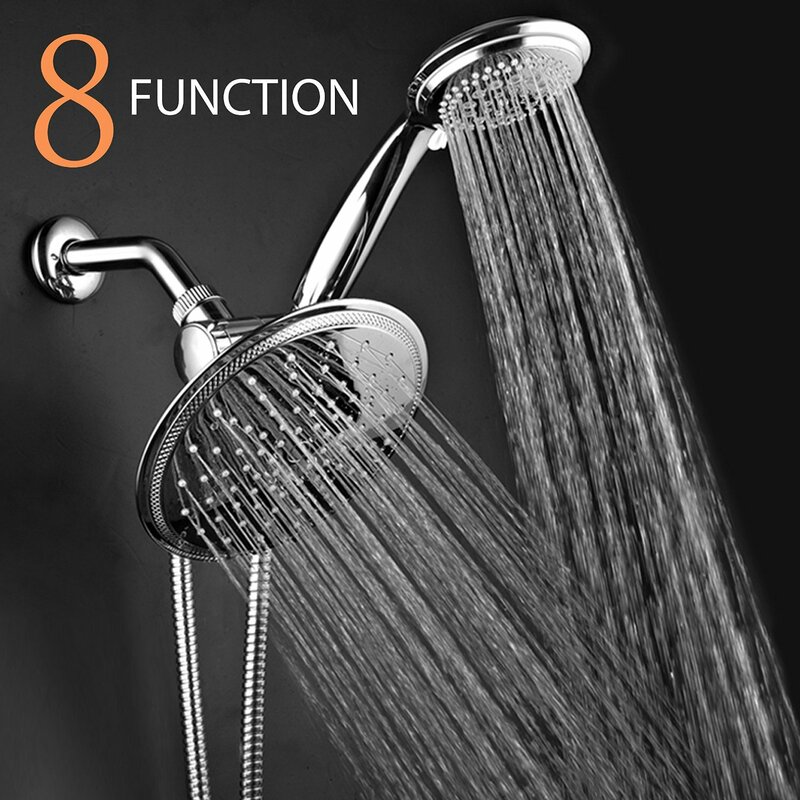 You get a total of 36 full and combined water flow patterns with 7 full setting high power shower head and hand shower. Choose from power rain, pulsating massage, hydro mist, eco rain, rain/mist, rain/massage and a pause button for times when you want to stop the flow or conserve water. This unit features a 3 zone click lever dial and easy to rub clean jets. The patented 3 wy water diverter features an anti sweivel lock nut for increased stability. The overhead bracket offers adjstable angles. This head combo comes with a flexible stainless steel hose and conical brass hose nuts for fast and easy tightening. You won’t need any tools for the fast and easy installation onto any standard overhead shower arm. Interlink offers a lifetime limited warranty when purchased from an authorized distributor. Users gave this shower head combo a 4.6 out of possible 5 star score. Most commented on the luxury of having so many water pattern and flow options. A few were put off by the plastic head construction, but also remarked that this does not affect the superb performance of this versatile shower head. High marks for amazing performance and dual use with great water pressure, even when using both heads at once. The DreamSpa Ultra Luxury shower head comes with a wide range of water pattern and flow settings. You can find the perfect flow each time you shower, whether you are in the mood for a relaxing slow moving shower or a more invigorating high powered massage. A 7 inch rain showerhead and 4 inch 6 setting handheld shower with an on, off and pause switch features a longer 7 foot stretchable stainless steel shower hose. Enjoy 3 way multi functioning using one head or both at the same time. You can make adjustments in water flow and pattern for up to 38 different settings which range from light shower to powerful massage. The overhead bracket features adjustable angle placement. The bell design is sleek and attractive with 3 zone click level dial and rub clean jet featres. Easy to install with no tools, this head can be connected to any standard overhad shower arm in just moments. Customers gave this shower head an overall rating of 4.7 out of a possible 5 stars. The most common remarks were regarding the ease of installation without the need for tools, no compromise on the water pressure, even when using both heads simultaneously, attractive apperaance and multiple settings to choose from. Enjoy the convenience of 5 settings for achieving the perfect water flow and pattern with this extra large Rainfall shower head. You’ll enjoy the comfort of relaxing mist when you are tired or stressed, or a more vigorous massage when you need a lift. 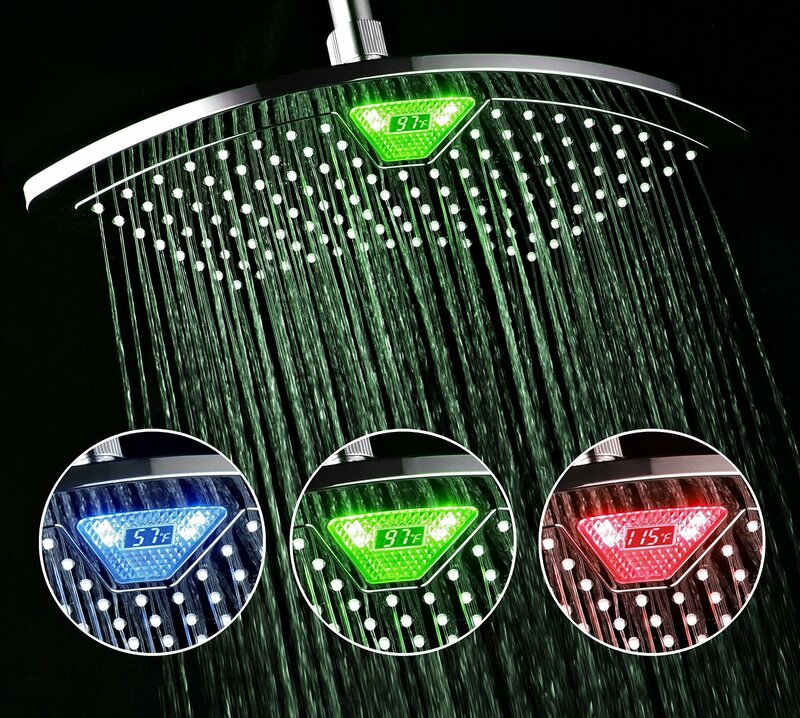 Eight inch Rainfall LED shower head has 5 settings and you won’t need batteries because it is powered by running water. Water temperature sensor features three color changes so you will know the temperature of the water. The chrome face is extra large for a wider spray pattern and body coverage. Three zone dial with jets that rub clean. The LED light is guaranteed for 10 years or 100,000 hours of heavy use. People who purchased and used this product gave it an overall rating of 3.9 out of 5 possible stars. The majority of users appreciated the spray pattern and found it to be a luxury model that gives you the means to achieve the type of shower you want each time. Some users reported issues with the functioning of the LED lights and that the warranty only covered them for one month, which was disappointing, lowering their overall rating of the product. This shower head is designed to provide you with an indicator of the water temperature so you can avoid scalding or getting into a shower that is not warm enough. The angle is adjustable with a 12 inch curved fan design for total body coverage. Built in water temperature sensor with large lighte LED/LCD display screen so you won’t have to guess what the water temperature is. No batteries required because it runs on water power. LD turns color with changing water temperature with flashing red warning when the water temperature exceeds 112 degrees. Customers rated this shower head with an overall score of 4.1 out of a possible 5 stars. 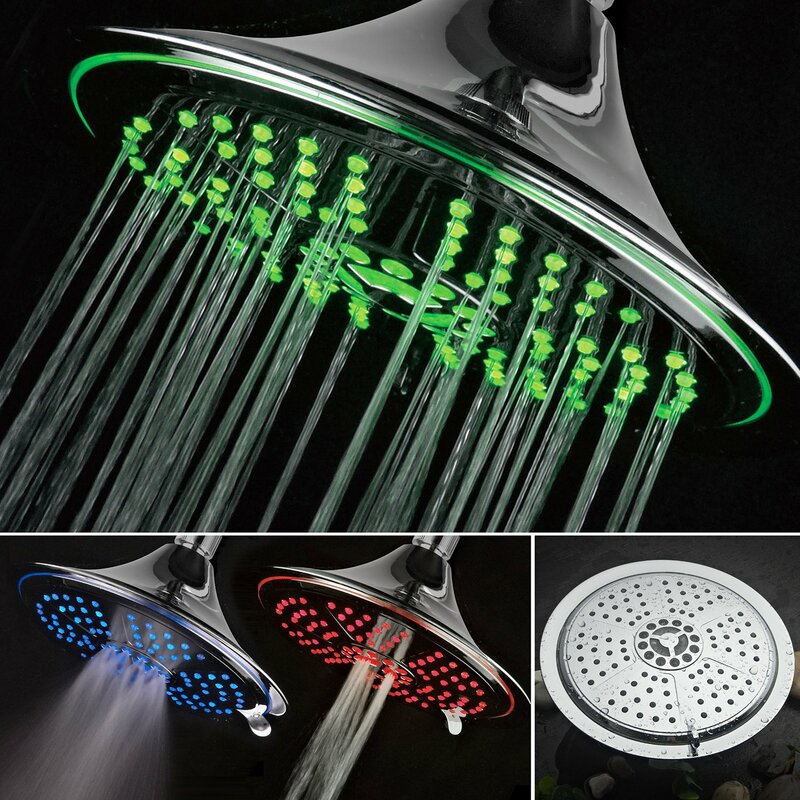 This shower head is innovative and uses temperature alert technology without the need for batteries, which is a plus. It is easy to install and use, but there are a few drawbacks. The LED feature tends to promote a light humming which isn’t very loud, but it’s there. Some customers were not pleased with the plastic construction and had issues with the shower head cracking. 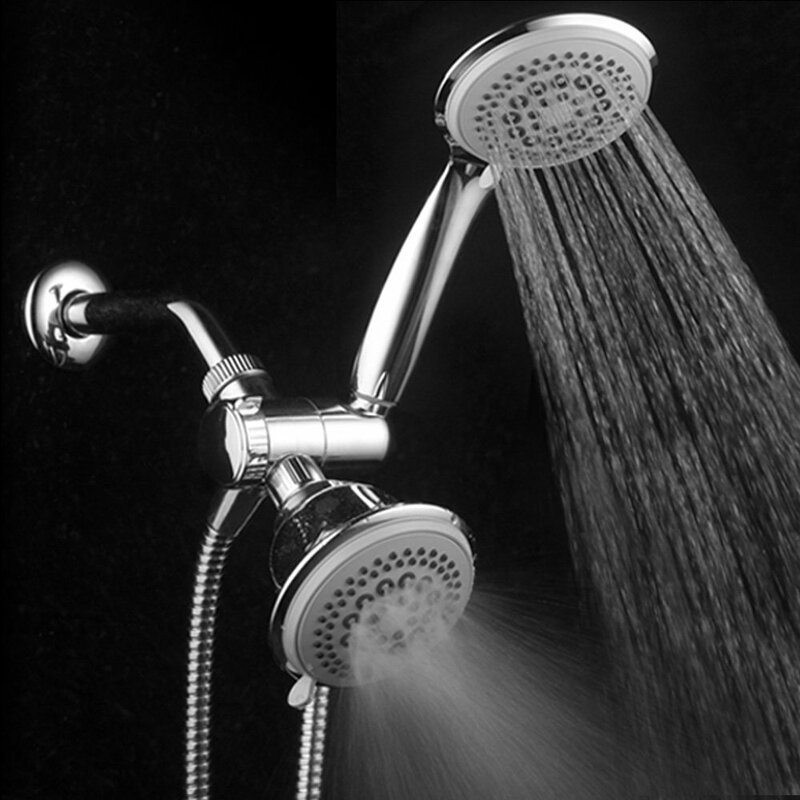 Overall, most users were pleased with the performance of this shower head, but some were not. DreamSpa shower heads offer a wide selection of bath products that can enhance your enjoyment of the showering experience. The main focus is upon comfort and user control, giving you options for adjusting your shower head or combo heads into the most comfortable positions. DreamSpa products have the added bonus of being Eco friendly and offering water saving options.